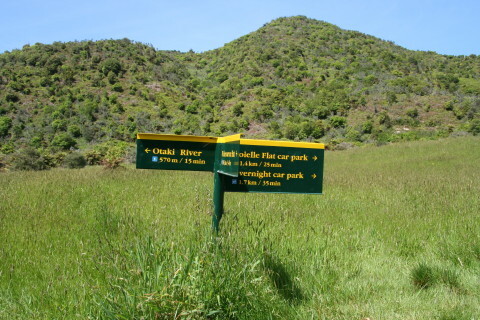 On the return from the Arcus Loop walk a signpost shows a short link track down to Otaki River. It begins by following the Waitewaewae track, then heads east to some stone walls. Beyond the stone walls a narrow track leads down through the bush to Otaki River. The descent is a little steep in places. Signposted off the Arcus Loop walk near the junction with Field Track and Waitewaewae track past Boielle Flat.